Mobile Computer Techs provides onsite computer support, computer services and computer repair in Macomb and Oakland Counties. 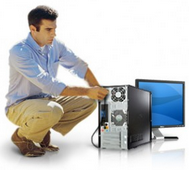 We specialize in onsite computer repair. You shouldn’t have to pack up your computer and transport it to the local computer repair shop to get it fixed. In addition to our excellent onsite computer service, we also provide after-hours computer repair and weekend computer repair at no additional charge. Our rates remain the same, $80.00/hour no matter when you need computer help. Just because you run a business, doesn’t mean that you should have to pay more for onsite computer repair, like many other computer repair companies charge more for business customers. Whether you are a residential client or a business client, the labor rate is always the same, $80.00/hour. We feel that our onsite computer services for businesses are even more crucial for you. How much productivity would you or one of your employees lose taking in one of your computers to be serviced? Our after-hours IT Support is of even more beneficial to the business owner. We work on your computer systems on site, while your employees are not at their desk, to resolve their computer problems without impacting your work environment or their productivity. Data Recovery, Data Backup, Computer Installation or Service, Computer Upgrades, Computer or Software Training, Computer Maintenance, Printer Help, Scanner Help, Smartphone Synchronization Help, Server Repair, Server Installation, Server Maintenance, Virus Removal including removing Adware, Malware and Spyware, Internet Setup, Wireless and Wired Network Setup and Repair. I have been using computers for over 20 years now, even before Windows was around. During that period I have used a number of computer service companies to both build and repair my systems. Based on the experiences I have had, both good and bad, I can say with some degree of authority that Mobile Computer Techs provides outstanding, knowledgeable service at a reasonable price. They have recently sold me a brand new Dell laptop system, which has a docking station, which makes taking my laptop with me a breeze now! I play first person shooters online and these guys optimized my system to run lag free. They also installed a faster video card and some extra RAM, and now I am screaming fast! They also removed a ton on spyware and adware from my computer, which was one of the main reasons that it was running so slow in the first place. Thanks guys! You rock! I had a cracked laptop screen and I got it replaced for way cheaper than what HP quoted me, and it was done at my work. I called on Tuesday and they ordered the parts and had it fixed by Friday. Fast turnaround time! Overall service was great. I got exactly what I wanted, and the experience went well. This company is awesome! I kept getting blue screens and random problems on my laptop. I found Mobile Computer Techs in the yellow pages online, and they installed a replacement hard drive and got it working in a day for me, which sure did help out, while I was in school. They were fast and did a good job for a reasonable price. If you are in a hurry and you don't want to trust your computer with guys who are going to take 2 to 3 weeks and still have no clue what course of action to take, then give them a call! The tech for Mobile Computer Techs worked tirelessly through difficult situations getting our systems at our company up to speed. It turned out to be several hardware issues, due to a power failure that we had from an electrical storm. Once the hardware was replaced everything worked great, and the tech did all the work right on site. Their service was invaluable to our company! I knew nothing about computers and Mobile Computer Techs not only helped me understand what was wrong with my computer, but they did what needed to be done to fix it, and I didn't have to call them back to fix it again, like I have with other computer repair companies that I have dealt with in the past. I approved their suggestions and got my computer fix very fast, and their prices were very reasonable. I would recommend them to anyone who needs help with their computer, especially if you are not very knowledgeable about computers. They have very friendly staff and helpful techs that make dealing with them very easy. I had a Windows XP computer that had many popup ads that would take over my browsing, and occasionally my computer would just freeze up. I called Mobile Computer Techs and they were able to repair the operating system and clean my infected computer. These guys know what they are doing and they were super friendly and quick with the repair, but best of all they made sure that I understood what I was being charged for, and what they did to resolve my computer problems. I recommend them for any computer repair services that you may have. Mobile Computer aTechs came and worked on my computer when I could not get my system to boot. I also had so many popup ads, and it was really running slow. I got a fast diagnosis and had the system repaired and ready for me while I watched at home. No more hassles with rip-off companies like those big box stores! Try these guys out, they know what they are doing and they will not rip you off! I have been using Mobile Computer Techs for my business for a few years now, and I am very pleased with them. They are really professional and helped build the current network that we are using now. We hire them for all our IT support, and they really live up to their slogan as being our personal IT department! They are prompt with getting things handled, and their rates are incredible, for the quality of service that they provide. The techs at Mobile Computer Techs really know what they are doing. They are actually truthful and honest, which I find is hard to come by today! It is like finding a good mechanic! My only regret in making this post is that I am telling more people about them instead of keeping it my own secret! Anyway, use them, you will like them! Great service for everything that I needed. They had very affordable prices, compared to other computer repair companies, and they did the work just as promised. A+. Best that I have dealt with so far. Mobile Computer Techs are so amazing and so knowledgeable. I had troubles after installing service pack 3 for Windows XP, and my computer would not boot up. I had Mobile Computer Techs come to my apartment and they fixed it fast! I am so tired of dealing with computer shops. Having the work done at my home while I watched was very interesting. They made the stuff that is a pain look so easy! If you have any computer problems give them a call. My computer was fixed quickly and affordably. They fixed my older Dell computer that was giving me lots of pop ups, and also blue screens. They were able to repair the operating system and remove all the viruses and spyware from my computer. No more rip off companies like the big stores who sent out young people who just wanted to sell me something that I didn't need! They knew what they were doing and they are very good! I found them to be fast, reliable, but best of all, honest! Mobile Computer Techs possess all the qualities necessary to meet the needs of their customers. I am convinced that Mobile Computer Techs offers the kind of personalized service needed for their customers. The support was done at my home, without me having to disconnect my computer and take it to them. That was so nice! As a small company in Utica, we needed help upgrading our computers and we needed a network installed for our company. Mobile Computer Techs helped us upgrade our computers and they installed our wired and wireless network. Their knowledge and ability to explain things to us was very comforting. We would not hesitate to call them again as our future technology requires. Mobile Computer Techs has been there to support me in my time of need, like when my computer crashed recently. He saved all my data and rebuilt my computer better than it was when it was new. I always know who to call when I need help.